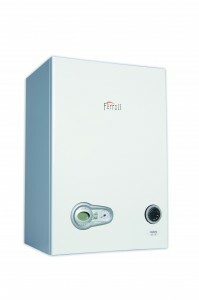 The Ferroli Modena HE range of high efficiency condensing boilers is now even more customer and installer-friendly with the addition of a range of new accessories, including four mechanical and digital timers and RF room thermostats. Since launching to the domestic market in January 2012, the Modena has gone above and beyond industry expectations of a boiler of this class, thanks to its exceptional reliability, high performance, ease of use and affordable price. But there’s always room for improvement and that’s what Ferroli has delivered with the 2013 version of the Modena, which now offers four choices of timers and thermostats, a rear pipe space frame and a valve cover. In response to this feedback, the fascia has been revised so that the pressure gauge is now visible next to the boiler display, with the timer now on the right. A mechanical timer – one of the most asked for accessories – is now available as well a digital version. Customers also have the option of either a mechanical or digital battery-operated RF room thermostat without the need for external wiring. The switching side is pre-wired and there is an auxiliary output for live and neutral. The programmer can be wall mounted or carried from room to room to allow the customer to set the temperature for each room according to their requirements. One of the Modena’s key features is its size – at just 600 x 400 x 320mm, it’s the smallest boiler on the market and can therefore be sited in practically any location – but with the new rear pipe space frame it’s even more adaptable. This accessory allows for the pipes to be run up behind the boiler instead of below or to the side. The new valve cover, which attaches easily to the base of the boiler, neatly conceals the valves for a clean look for appliances installed between kitchen units or anywhere in full view. The Modena HE range is available as 27kW and 32kW combination and 18kW, 25kW and 32kW system models. All are available with a choice of 2 or 5 year full parts and labour manufacturer’s warranty.